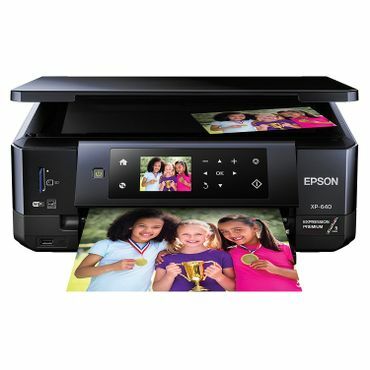 If costs matter, the Epson Expression Premium XP-640 is a terrific home all-in-one printer. 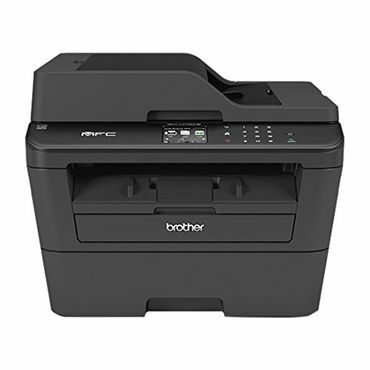 For busy offices, the Brother MFC-J985DW is a workhorse. HP and Canon make top laser alternatives. Color laser multifunction printers, budget choices, and whether or not an AIO is the right choice for you are also discussed. The Epson Expression Premium XP-640 is an all-in-one inkjet printer that produces good-looking text and photos at a budget price. It prints at a snappy 9.4 ppm, and it gives you lots of options for connection to a computer, mobile device, or camera. It also offers such perks as touchscreen controls, auto duplexing, and a second paper tray. However, it doesn’t include an ADF or fax functionality, and ink costs are rather high. Inkjet all-in-one printers can be ink-guzzling money pits — but the Brother MFC-J985DW is refreshingly different, experts say. It’s as cheap to run as a bare-bones black-and-white laser printer, but with color inks to print photos and graphics. It’s built for home or small office use, with a handy duplexer, a 20-sheet ADF, touch-screen controls, and a fax function. Networking options include wired, Wi-Fi, mobile, and cloud connections. 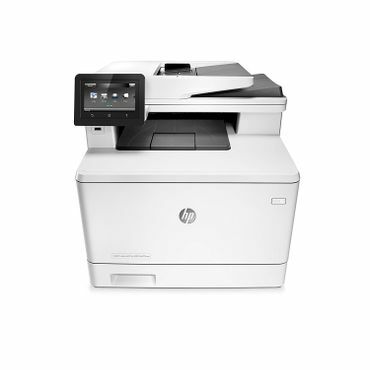 For fast black-and-white printing, the HP LaserJet Pro MFP M426fdw is the best choice. It pumps out text pages at 21.5 ppm, and print looks sharp and clear. Scan and copy quality are good, too, and the cost of toner comes to a mere 3.2 cents per page. Its single-pass duplexer copies, scans or faxes both sides of a page simultaneously. Other perks include a 50-sheet ADF, two standard paper trays, and full networking options. If you’re looking for laser speed on an inkjet budget, the Canon imageCLASS MF244DW is your best bet. 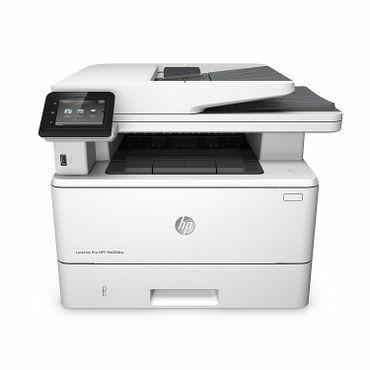 It skips some of the features of to the HP LaserJet Pro MFP M426fdw, such as a fax function, duplex scanning, and NFC support, in exchange for a significantly smaller price tag. It can print at a decent 18.5 ppm and produces high-quality printed and scanned images. And at 4.1 cents per text page, its toner cost won’t bankrupt you. Color laser printers don’t come cheap, but reviews say the HP Color LaserJet Pro M477fdw packs a lot of bang for the buck. It’s blazing-fast and feature-rich, with an elegant single-pass duplexer, touch screen, cloud connectivity and walk-up USB port for inserting a thumb drive. Both text and color graphics look great, and high-yield toner cartridges keep per-page costs reasonable. Its 250-sheet paper tray and 50-sheet ADF are large enough for small offices. All-in-one printers (AIOs) — also called multifunction printers (MFPs) — are inkjet or laser printers that, in addition to printing, can scan, copy, and, in many cases, send and receive faxes. 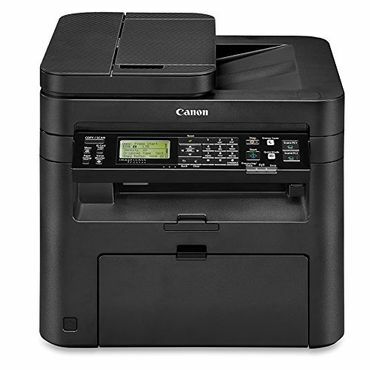 The latest all-in-one printers print wirelessly from your computer, smartphone, or tablet. Many can connect directly to the web, so they can print web pages, emailed documents, or documents stored in the cloud. Prices of all-in-one printers have fallen in recent years, with many excellent models selling for $200 or less. As a result, all-in-ones now account for the majority of printers sold for home use. However, while all-in-one printers might appear to be do-everything devices, reviews show that they usually aren’t equally adept at printing, scanning, copying and faxing. Often, a multifunction printer that excels in one aspect falls short in others. Still, if you only occasionally need to fax, copy, or scan, an all-in-one printer can save you from having to buy two or three separate devices. On the other hand, if you don’t think you really need to scan or fax, you can save a bit of money by going with a standard inkjet printer, laser printer or color laser printer. You can also save desk space, since all-in-ones generally take up more room than a standard printer (although not nearly as much as a separate printer, scanner, and copier). ConsumerSearch covers standard printers in separate reports. If all you want is a scanner, we have a separate report on those as well. Inkjet All-In-One PrintersThis type of all-in-one prints by spraying ink onto the page. While they’re cheap at the outset – we found a very good inkjet MFP for $90 – you’ll pay dearly for replacement ink cartridges. AIOs tested by Consumer Reports cost between $180 and $720 to buy and run for two years. Ink cartridges also tend to clog or dry up if the printer is left idle, requiring an ink-guzzling cleaning cycle to get them working again. Still, if you plan to print photos, you’ll need an inkjet. Even an inexpensive inkjet MFP can print decent-looking color snapshots on glossy photo paper, unlike the vast majority of laser printers, though many dedicated inkjet printers can print photos that are nicer still. Monochrome Laser All-In-One PrintersLaser printers work by bonding powdered ink (toner) to the page. They’re a better choice for heavy users because toner doesn’t dry up or clog like ink, and you can print more pages on a cartridge. These days, a good black-and-white (monochrome) laser MFP doesn’t cost that much more than an inkjet; we found a great budget model for $140. Mono laser all-in-one printers cost about the same to own over two years as inkjets: between $210 to $550, including the purchase price of the AIO. Plus, you’re rewarded with sharp text and faster printing than an inkjet. Mono laser all-in-ones can usually scan in color, even though they only copy and print in black and white. Color Laser All-In-One PrintersColor laser all-in-one printers cost the most – over $450 for our Best Reviewed pick. They cost the most to run, too ($430 to $960 over two years, including the printer’s purchase price), and they still don’t print photos as well as an inkjet. Their strong point? Color graphics and text. If you need to print professional-looking color documents for your home or business (brochures, charts, etc. ), a good color laser all-in-one printer will print them crisply, quickly, and with few ink aggravations. To find the best all-in-one printers, we evaluate all aspects — ease of use, features, cost to own and, of course, how well they perform. We study professional tests at tech-specific publications such as Tom’s Guide, PCMag, and Wirecutter. PCMag also conducts an annual Readers’ Choice survey to find out which printer brands break down the least. We also look at Consumer Reports, which conducts thorough, unbiased tests for more than 130 all-in-one printers, but provides less discussion than the other sites. Owner reviews at retail websites (such as Staples, B&H Photo, Amazon and Best Buy) provide the last piece of the puzzle; they unearth real-life problems that don’t show up in short-term tests. (Est. $90). This inexpensive AIO is a Best Buy at Consumer Reports and earns the title of best all-in-one photo printer in Tom’s Guide. The reviewers at Tom’s Guide are impressed with its “warm skin tones” and “well-saturated colors,” as well as with its ability to print a color photo in about two and a half minutes – twice as fast as the average printer in its tests.Consumer Reports is a little less enthusiastic, saying color graphics come out very well on this machine, but photo and text quality is only average. However, the XP-640 offers numerous other benefits. Text printing is quick, at 9.4 pages per minute (ppm). Scans and copies both look very good in tests, and the editors say it’s one of the easiest printers to use. It can print from your PC over either USB or Wi-Fi, from an SD card, from your camera via PictBridge, or from your tablet, or phone. Its auto duplexing feature can print both sides of a page “with no loss of quality.” It has touchscreen controls and a secondary paper tray for photo paper. Also, it uses very little ink for maintenance. While expert reviews are very favorable, we found somewhat mixed feedback for the Epson Expression Premium XP-640 among users. It earns overall ratings of 4 stars out of 5 or better at Best Buy and B&H Photo, where owners praise its print quality and easy setup. However, at Amazon, about one in three reviewers blasts it with a 1-star rating. Aside from the pricey ink, owners complain of malfunctions, frequent paper jams, and poor customer service. Some also claim that a firmware update has made it difficult if not impossible to use non-Epson inks. That backs up the findings of some large user surveys. A Consumer Reports survey found that one out of every five new Epson inkjet printers broke within three years, as opposed to about one in eight Brother inkjets. And in PCMag’s reader survey, Epson earns a below-average score of 7.9 points out of 10. That’s all a little concerning, but given the low purchase price, and the strong feedback from experts and most users (for example, 4.3 stars based on nearly 1,600 reviews at Best Buy), we think that the Epson is an appropriate choice for home use. (Est. $160). Tom’s Guide rates it the best all-in-one printer for high-volume printing, saying it has “one of the best costs per page in its class”: just 0.8 cents per black-and-white page and 4.6 cents for color. Consumer Reports puts the price a bit higher, at 2.8 cents for a page of text, but agrees that it’s one of the cheapest for inkjet printers. However, the editors note that this MFP uses more ink than most for cleaning cycles. Still, it will cost about $60 less to own over two years than the Epson, even with its higher purchase price.In Consumer Reports’ tests, the Brother nearly matches the Epson for speed, shooting out about 9 ppm. However, it’s much slower for photos, taking 6 minutes, 47 seconds to produce a color print in tests at Tom’s Guide. On the plus side, testers agree that color photos, as well as scans and copies, all look quite good. Brother says the printer can churn out up to 2,500 pages in a month but recommends a maximum of 1,000 pages per month in normal use. Like the Epson, the Brother printer can print over wired and wireless connections from a computer, smartphone, or tablet. It also offers Ethernet and NFC connections, which the Epson doesn’t have. However, it can’t link to a camera via PictBridge. In addition to a built-in duplexer, the MFC-J985W has a 20-sheet automatic document feeder for faster scanning and copying. It also includes a fax function. 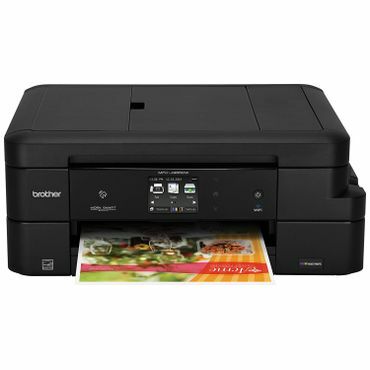 Owners at Amazon and Staples are mostly happy with the Brother MFC-J985DW. They say it’s easy to set up, and the ink really does last a long time. Most are happy with its print quality, although some say that colors are off or look washed out. There are also some complaints of glitches, though not as many as we saw for the Epson. Brother printers as a group deliver the highest user satisfaction in PCMag’s reader survey, with 8.6 points out of 10 overall and top marks for ease of setup, reliability, and consumables costs.